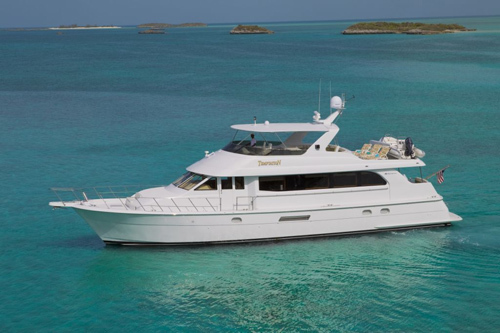 Motor yacht TEMPTATION measures 22.8m (75ft), she was launched by the renowned Hatteras shipyard in 2004. M/Y TEMPTATION is the ideal charter yacht for groups of friends, offering 3 double cabins and plenty of interior and exterior amenities. 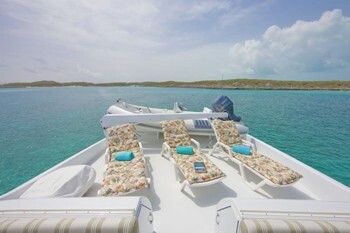 She is available for luxury yacht charters in the Bahamas for up to 6 guests. 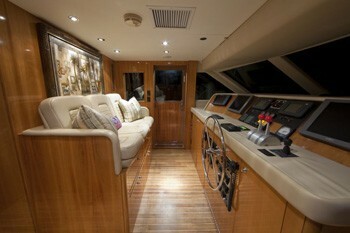 Crewed charter yacht TEMPTATION has a light airy interior, featuring a neutral contemporary theme. 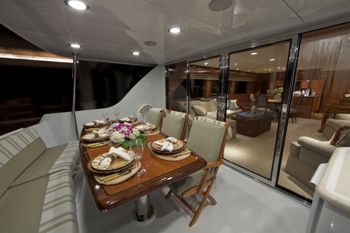 The salon, dining and galley are set in an open social atmosphere, perfect for both casual and formal occasions. 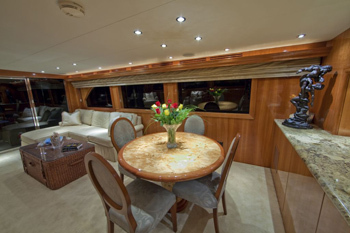 The lounge is aft with adjacent sliding doors, leading to the shaded aft deck. Forward of the lounge a formal dining table seats 6 guests easily. Further forward, a marble topped breakfast bar separates the galley on port. 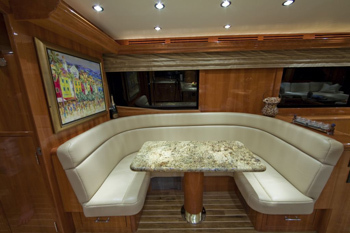 Starboard of the galley is a comfortable built in dinette, ideal for less formal meals. Exterior living aboard the yacht TEMPTATION is generous and laid out on 2 decks. The aft deck offers shade, an alfresco dining option and drink service area. 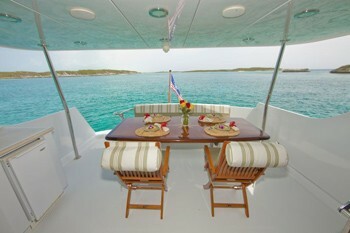 Further aft and extended swim platform allows effortless access to the many water toys on offer and warm azure waters. 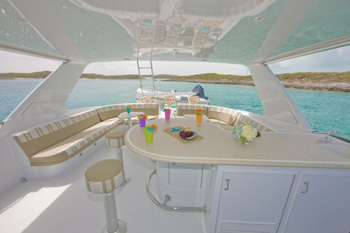 For an intimate escape, the foredeck offers built in seating. 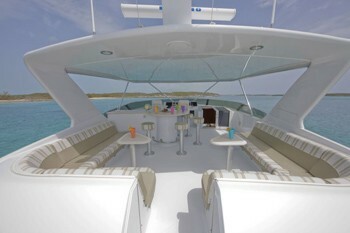 The upper deck is spacious, featuring a complete wet bar, ample seating, cocktail tables, partial shade and chaise lounges. 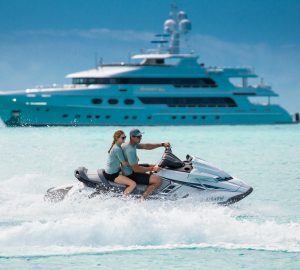 Motor yacht TEMPTATION has a beam of 5.7m (19ft) and a draft of 1.8m (6ft), she is powered by 2 x CAT engines and capable of speeds ranging from 18 – 28 knots. 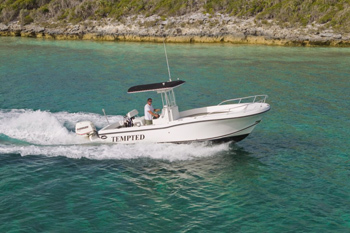 M/Y TEMPTATION has many great amenities including a towable 23ft tender, ample water toys and full audio and visual entertainment in the salon and each cabin. 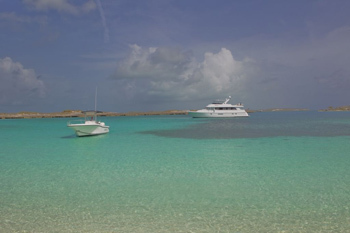 The TEMPTATION motor yacht offers 3 double en-suite cabins for up to 6 charter guests. 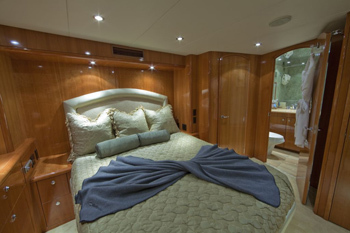 The master stateroom is aft offering a king size bed and en-suite with Spa Pool tub. 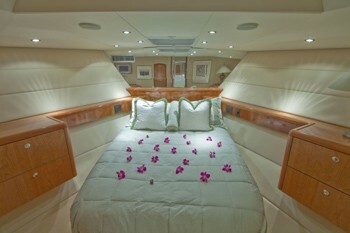 The VIP suite is amidships offering a queen size bed and en-suite with Spa Pool tub. 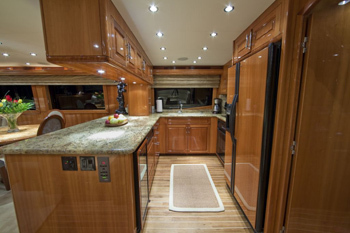 A guest cabin is forward, featuring a queen size bed and en-suite with shower room. All 3 cabins have a serene soothing décor, walk around beds, cedar lined closets and full audio and visual entertainment systems. The professional crew of 2 have separate quarters.